1. A provision designating pleadings and defining a motion is common in the State practice acts. See Ill.Rev.Stat. (1937), ch. 110, §156 (Designation and order of pleadings); 2 Minn.Stat. (Mason, 1927) §9246 (Definition of motion); and N.Y.C.P.A. (1937) §113 (Definition of motion). Former Equity Rules 18 (Pleadings—Technical Forms Abrogated), 29 (Defenses—How Presented), and 33 (Testing Sufficiency of Defense) abolished technical forms of pleading, demurrers, and pleas, and exceptions for insufficiency of an answer. 2. Note to Subdivision (a). This preserves the substance of [former] Equity Rule 31 (Reply—When Required—When Cause at Issue). Compare the English practice, English Rules Under the Judicature Act (The Annual Practice, 1937) O. 23, r.r. 1, 2 (Reply to counterclaim; amended, 1933, to be subject to the rules applicable to defenses, O. 21). See O. 21, r.r. 1–14; O. 27, r. 13 (When pleadings deemed denied and put in issue). Under the codes the pleadings are generally limited. A reply is sometimes required to an affirmative defense in the answer. 1 Colo.Stat.Ann. (1935) §66; Ore.Code Ann. (1930) §§1–614, 1–616. In other jurisdictions no reply is necessary to an affirmative defense in the answer, but a reply may be ordered by the court. N.C.Code Ann. (1935) §525; 1 S.D.Comp.Laws (1929) §2357. A reply to a counterclaim is usually required. Ark.Civ.Code (Crawford, 1934) §§123–125; Wis.Stat. (1935) §§263.20, 263.21. U.S.C., Title 28, [former] §45 (District courts; practice and procedure in certain cases) is modified insofar as it may dispense with a reply to a counterclaim. For amendment of pleadings, see Rule 15 dealing with amended and supplemental pleadings. 3. All statutes which use the words “petition”, “bill of complaint”, “plea”, “demurrer”, and other such terminology are modified in form by this rule. This amendment [to subdivision (a)] eliminates any question as to whether the compulsory reply, where a counterclaim is pleaded, is a reply only to the counterclaim or is a general reply to the answer containing the counterclaim. See Commentary, Scope of Reply Where Defendant Has Pleaded Counterclaim (1939) 1 Fed.Rules Serv. 672; Fort Chartres and Ivy Landing Drainage and Levee District No. Five v. Thompson (E.D.Ill. 1945) 8 Fed.Rules Serv. 13.32, Case 1. Certain redundant words are eliminated and the subdivision is modified to reflect the amendment of Rule 14(a) which in certain cases eliminates the requirement of obtaining leave to bring in a third-party defendant. One of the reasons sanctions against improper motion practice have been employed infrequently is the lack of clarity of Rule 7. That rule has stated only generally that the pleading requirements relating to captions, signing, and other matters of form also apply to motions and other papers. The addition of Rule 7(b)(3) makes explicit the applicability of the signing requirement and the sanctions of Rule 11, which have been amplified. 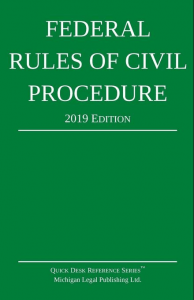 The language of Rule 7 has been amended as part of the general restyling of the Civil Rules to make them more easily understood and to make style and terminology consistent throughout the rules. These changes are intended to be stylistic only. Former Rule 7(a) stated that “there shall be * * * an answer to a cross-claim, if the answer contains a cross-claim * * *.” Former Rule 12(a)(2) provided more generally that “[a] party served with a pleading stating a cross-claim against that party shall serve an answer thereto * * *.” New Rule 7(a) corrects this inconsistency by providing for an answer to a crossclaim. For the first time, Rule 7(a)(7) expressly authorizes the court to order a reply to a counterclaim answer. A reply may be as useful in this setting as a reply to an answer, a third-party answer, or a crossclaim answer. Former Rule 7(b)(1) stated that the writing requirement is fulfilled if the motion is stated in a written notice of hearing. This statement was deleted as redundant because a single written document can satisfy the writing requirements both for a motion and for a Rule 6(c)(1) notice. The cross-reference to Rule 11 in former Rule 7(b)(3) is deleted as redundant. Rule 11 applies by its own terms. The force and application of Rule 11 are not diminished by the deletion. Former Rule 7(c) is deleted because it has done its work. If a motion or pleading is described as a demurrer, plea, or exception for insufficiency, the court will treat the paper as if properly captioned.